The readers have voted, and City-State of the Sea-Kings has made it to the top of the review pile here at the Tavern. I'll start digging into it heavy tomorrow. Close behind it will be the Adventures Dark and Deep Player's Manual. Rounding out the top 5 are Five Ancient Kingdoms, Whitehack and Arrows an Indra. The above will all have multi part (or continue) reviews. 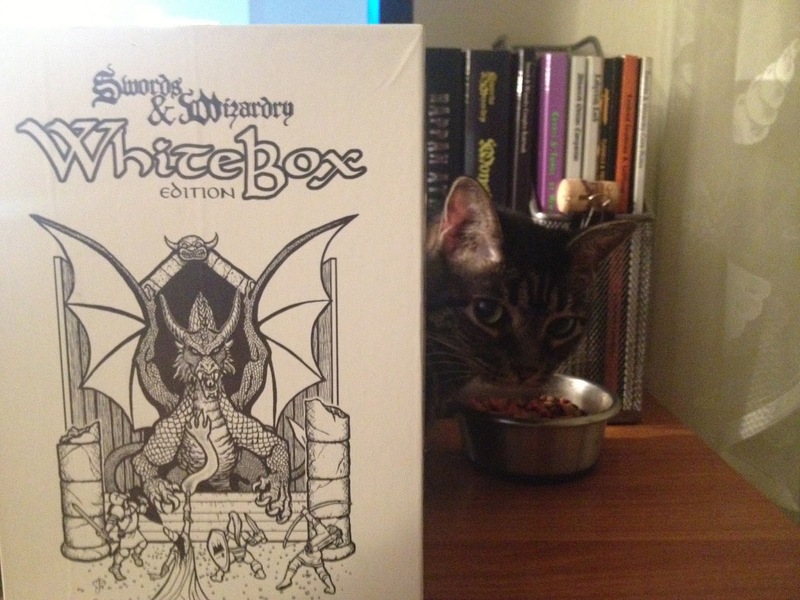 Those not in the top five, as well as other items that crop up (like some DCC RPG adventures - hint, hint) will get the usual mini-reviews inter-spread amongst the longer reviews. Tomorrow I'll award the random RPGNow Gift Certs. One will be awarded on the G+ side and three on the blog side. There. I said it. Westward is a "steampunk western". Wasn't there a TV series a little while back that hit on both themes? Personally, I really like the D6 ruleset, even in it's various flavors. I have fond memories of WEG Star Wars, and it's a simple enough system to learn with a decent amount of options. Well, that and the core D6 books are free. As in, well, free. Oh, and OGL. So have a blast. Westward, the "steampunk western" comes in 2 flavors. "Pay what you want" (slightly crippled - no printing, no copy / paste, etc) and a full usable (printable) version for 10 bucks. The contents are the same in each, and neither requires other rules - they are self contained. So, here's my advice. Pay NOTHING for the PWYW version of Westward. Set some time asides, as it's over 350 pages long with some decent color art. If you like what you see, and want to actually use it, as a GM or player, plop down the $10 for the full, printable version. Why pay twice? I do suggest grabbing a copy of Westward, even it it's just for ideas in other games. The price is right. Westward Premium is the HighResolution version of Westward. Buy the Premium Edition to remove the watermark, enable copy and paste, and printing! As of this posting, City-State of the Sea Kings has 21 votes between the blogside and G+ (G+ has been fairly quite). The other front runners are Adventures Dark and Deep Players Handbook, Arrows of Indra, Five Ancient Kingdoms and Whitehack (all with 10+ votes). There's a complete listing of the slush pile (and vote placing) going on on this post. Voting is open until tomorrow (Saturday night). I'll close the voting whenever tomorrow's game session wraps up. For every 20 vote posts (unique, you can only vote once but may vote for up to 3 items to be reviewed) or fraction of 20 posts, I'm putting a $5 RPGNow Gift Certificate into the random prize pool. The blogside currently has 2 GCs in the pool (to be awarded Sunday) and the G+ side currently has 1 GC in it's pool. Help decided what gets moved to the top of the review pile! How Encumbering is Encumbrance in Your Campaigns? Do you strictly track encumbrance? Hand wave it? Ignore it? Give everyone in the party Bags of Holding and hope it all goes away? I find myself somewhere between ignoring and hand waving. Trying to jump over a pit trap? What are your carrying. Otherwise, I dont give it much thought, as the play is the game, not the number crunching. Still, LotFP has a decent semi-abstract encumbrance system that doesn't seem to be overtaxing. How do you handle encumbrance in your games? Lets see, for as little as $4, you get FATE Core, FATE Accelerated, Spirit of the Century (my personal introduction to FATE), Full Moon and Ehdrigohr. Beat the average price folks are paying (as I type this, its a hair over 12 bucks) you also get Starblazer Adventures, Legends of Anglerre, the Kerebos Club and any future additions to the bundle. If you are "FATE Curious", this is you opportunity to get a ton of FATE for a really cheap price. Did I mention it's all DRM free? Vote on What Gets Moved to the Top of the Tavern's Review Pile - Because it's a Damn Big Pile! I have a shitload of stuff to review, and I'm failing badly at doing so. Work is taking up more time then it had (which means overtime and more money to spend on goodies, so I'm not really complaining) but it does mean free time is at a premium. So, I'm letting you vote on what gets moved to the top of the review pile (one random voter gets a $5 RPGNow credit, so there is an added bonus in voting). Adventures Dark & Deep Players Manual - a AD&D 2e "what if". City State of the Sea Kings - a new Wilderlands sourcebook / campaign. Stoneheart Valley - just noticed the S&W version says "Pathfinder" on the cover - that's going to make for some confusing retail sales. I'll leave the voting up through Saturday evening. Vote on the blog or G+. Vote for up to 3 choices. All picks get equal weight. Do You Use Alignment in Your Campaigns? I use it, but there are times I wonder why I bother. I'm beginning to wonder if more general good / indifferent / evil type of axis would be more effective in future campaigns for my usual group. More latitude and less "various interpretations". So, do you use alignment as is? Do you tweak it? Drop it all together? The last few months for my gaming group have been hit or miss - at times, of the 8 in the group, only 3 or 4 can make a session. Not an easy way to move on with a campaign of DCC that usually has 6 or 7 players / PCs when we game. And yeah, that is a sign of the summer months, but I'd like to be prepared in any case. This means the sessions we wind up short either become yap sessions (not bad in and of itself) or get canceled outright. So, looking for ideas of RPGs that can be run with little set up, short rules, easy to throw and adventure together, doesn't rely on niche protection and can handle small parties. This book is more massive than I expected. City-State of the Sea Kings clocks in at 380 pages and a map. The map itself is two-sided. One side has the numbered hex map of the Isle, the other side has the map of the city. Both are very well done. I didn't realize that this is one of the last projects that Bob Bledsaw senior had an active hand in (but I found out that and more reading the foreword - good thing I didn't skip that like usual). It uses the "Judges Guild Universal System" for stats, which is easier to understand and convert (for me at least) then the system used in Lich Dungeon and the like. Still would have preferred OSR generic, but the system used has history behind it and is familiar to many. Layout is easy on the eyes (I do wonder about all of the highlighting throughout the text, but maybe that will sort itself out with a solid read). You probably could run a full campaign from beginning to end on this isle. I want to move this to the top of my review pile - but that pile is getting friggin huge! Still, City-State of the Sea Kings is calling to me - loudly. What is Your Favorite OSR "Clone" Ruleset? 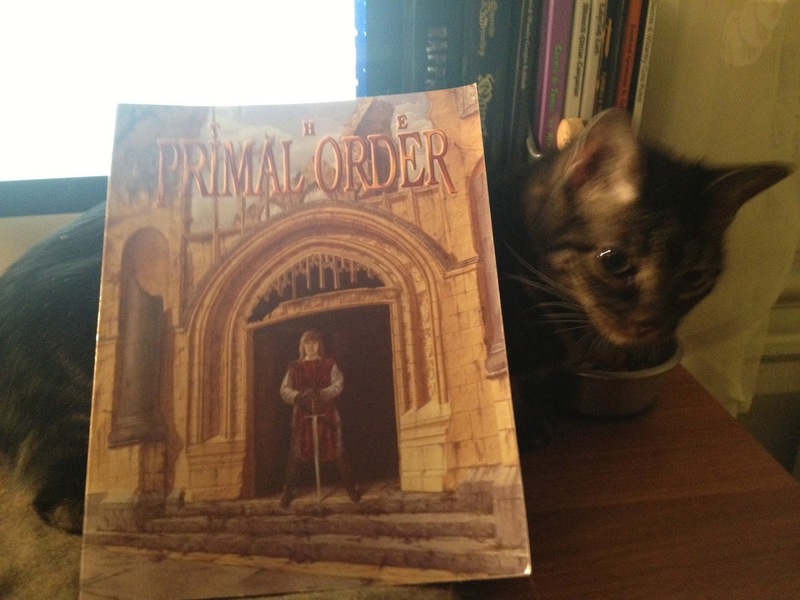 I have a fairly decent list of OSR ruleset to the right of this post, but I'm sure it's incomplete. Anyhow, my favorite OSR "Clone" (and a clone is in no way needs to be a prefect copy of the source material in this definition I'm using - it's more flavor and spirit than rule and letter) would be Swords & Wizardry Whitebox Edition if you are going by the actual boxed set. There is something about the box itself that just makes it special. The Deeper Delving Boxed set fails to recapture the same magic. If I want an AD&D feel without the clutter, I'd go S&W Complete. Labyrinth Lord AEC comes damn close, but the need of two rulebooks compare to the one of S&W Complete is the tie breaker for me, if you will. So, what are your preferred "clones"? Appendix N - I got mine, but most folks ain't got their. Folks are getting antsy. Far West - there's talk about the PDF of the rules being released this month. Normally I'd laugh dismissively, but I just had my backer portrait emailed to me, so I can actually say "there's been some progress".Still hopelessly late. The Perfect Beer Drinking Vessel and Private Keg! - not a gaming product, but I'd really like this by the end of the year. Updates fairly frequently. OpenQuest 2 - just got the PDF today. Reminds me a bit of RQ2. I need to sit down and read this. I also need more time to do all of the things I want to do. Almost off the list. Dungeon Deck: Quests - last update 9/7, stating that the overdue project still hadn't shipped from India - promised and update when there was something to update, so I guess a month later it still hasn't found its way onto a boat. Tavern Cards - last update 8/4. Estimated to ship back in April. It's not the lateness so much as the lack of communication that irks me. The Skies Over Danbury - Dungeon World Adventures - Barely late, but the last update was back in June, and it was awaiting layout by an overworked, over committed, layout artist. Ah well. Tales From the Fallen Empire: Sword and Sorcery Setting - was it really due back in January? Myth & Magic Player's Guide - 2E Revived and Updated!!! - he says it's shipping. Supposedly 98 shipments went out, apparently to folks that don't do social media, as I've failed to spot a copy "in the wild". Who knows, maybe one of my readers has a copy and can show us - for real yo! Dwimmermount - I really wish Tavis and company all of the best, but this project is cursed. It's given me lots of blogging material, so maybe I've already gotten my monies worth... or not. I'm one of the asses that went in for the vinyl maps. Nystul's Fiascos - one for all, and all for naught. Thank God I didn't put in at the "Dwarven Stein" level to round out my drinking vessels collection. Shift responsibility away from "Mad Mike" and on to others - Mike is slick, I'll give him that. Ogre - maybe in time for this Christmas? So, I'm currently digging through what is now the living room closet (formerly my bedroom before renovations) as I'm looking to add some soundproofing to the back of it (my son's room is on the other side). In the course of moving stuff out of the top (nearly all gaming material) I came across this gem - The Primal Order from Wizards of the Coast from back in 1994. 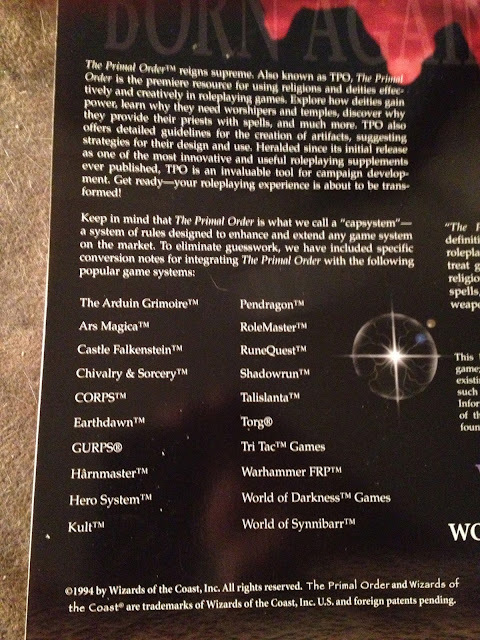 Yep, that's before they bought out TSR and grabbed D&D and all of the rest. Now, look at the back cover (or at least, the part of the back cover I took a picture of. Notice and game missing from that list? I guess TSR - They Sue for Real was the sleeping giant they didnt want to stir up. What is Your Favorite Classic "Old School" Gaming Module / Adventure? I was thinking about all of the great (and not so great) modules I picked up in my teens and early 20's - mid 80's to early 90's - and I find myself surprised that my favorite modules of the era are not from TSR. Heck, they aren't for (A)D&D at all. Instead, they are for RuneQuest 2 - the Chaosium edition. 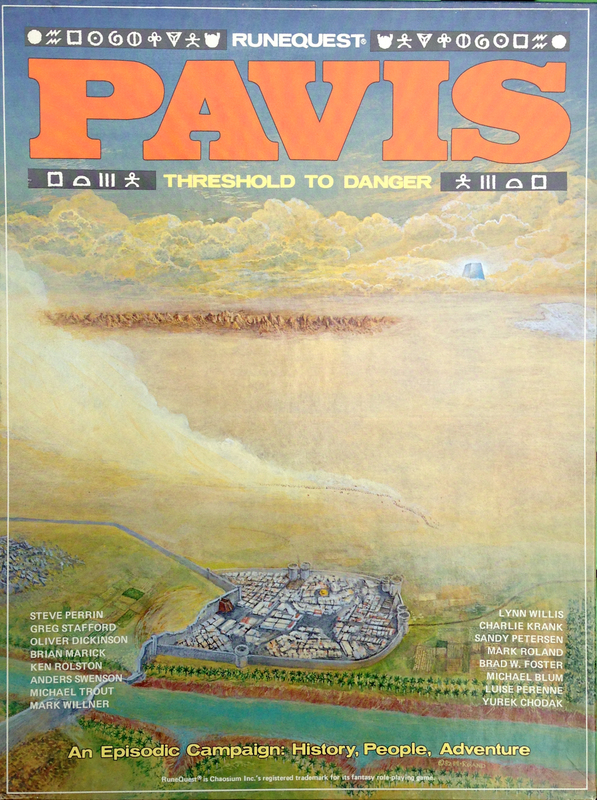 Pavis and Big Rubble, because in truth, they are just two parts that make up one exciting sandbox. I ran this in both RQ3 and RQ2, using the Chaosium boxed sets that I picked up at a con held at Columbia University back in 86 or 87. The boxes had some shelf wear and crushing going on, but their contents were intact. It didn't hurt that I picked up a HC of the RQ2 rules from the same vendor. I suspect if I had found Judges Guild's Wilderlands back in my early gaming days, my answer to the question would have been made a bit harder to come to - probably the same conclusion, just not so clear cut. So, what's your favorite classic "old school" gaming module / adventure? I'm a big fan of The Tome of Horrors Complete for Swords & Wizardry. It's a hefty tome, but it adds so many options for OSR styles gaming as far as monsters go, it's almost indispensable. Almost. The price is a horror for many, even if the hard cover includes a PDF copy in the price. 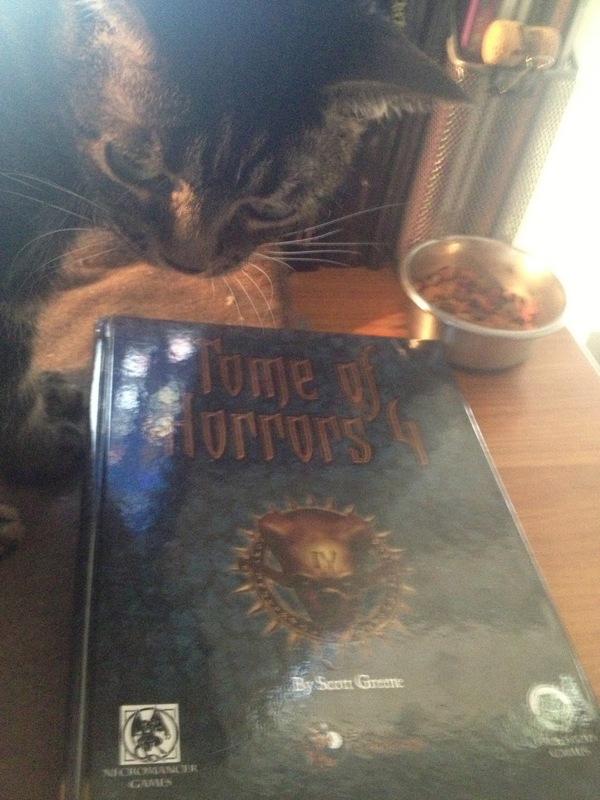 Did I mention my wonderful cat knocked a glass of water off the desk and onto my copy of The Tome of Horrors Complete below? That was a year or so ago. Damage was minimal and obviously she (the cat) still lives. ToH Complete isn't so complete anymore, with the addition of Tome of Horrors 4. 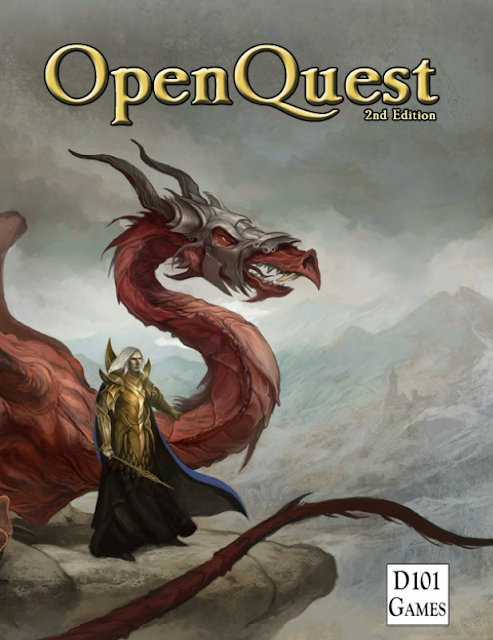 $44.95 for the print + PDF (and 5 bucks for the Pathfinder version and 50+ pages - Pathfinder certainly can be a bloated system). Is it worth you dollars? Are you a completist? If you own ToH Complete, you'll certainly want ToH4. Are you a monster junkie? This is a well presented monster book with awesome art and an adventure seed for each monster. Are you writing your own adventures for you group? You can keep them on their toes by introducing monsters from the ToH series. Are you running a published campaign / series of modules / megadungeon? Much less valuable for you. ToH4 is very well done and is worth the price for me, but it may not be for you. It's a bit of a niche product. Monstrosities is probably the monster book to start with if you need a basic monster book for your OSR campaign.